This walk starts and ends in the Ayot Greenway car park just north of Ayot Green. It crosses open fields, reaches the halfway point at Ayot St Lawrence where you can take a break at The Brocket Arms, and then returns through wooded paths and bridleways as they weave their way back to the car park via Ayot Greenway. From the car park, follow the course of the old railway track, the Ayot Greenway, as it heads west. You will have to cross a lane soon after the start. 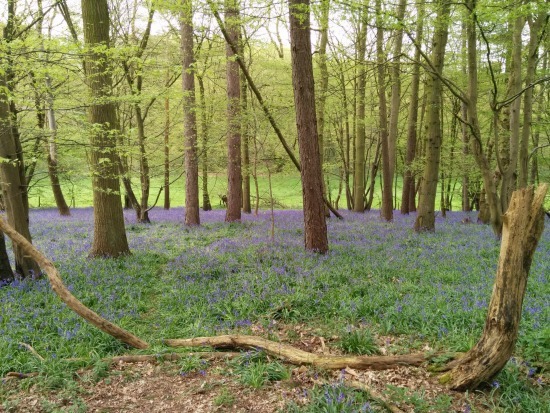 You soon come to woodland on your left called Long Spring, that, in April, has a spectacular carpet of bluebells (see image above). 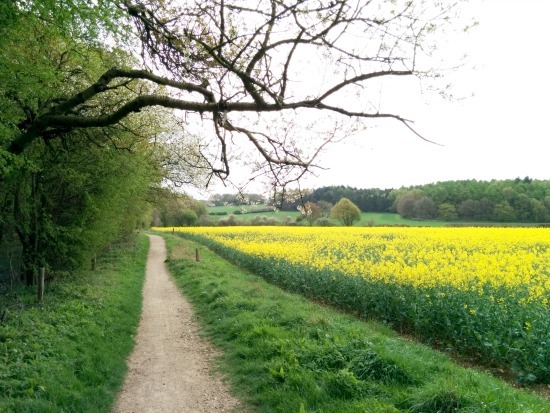 Continue along the Ayot Greenway until you pass a wood on your right, Saul's Wood, and open fields. Look out for a path on your right leaving The Ayot Greenway just after Saul's Wood. Take this path as it goes diagonally across the field heading northwest. On the other side of the field you come to a track. Turn right. 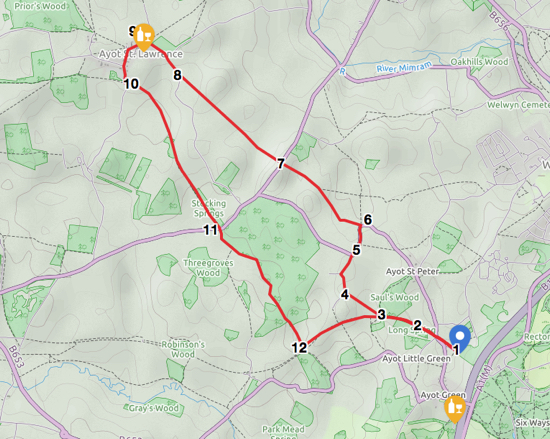 Follow this track as it bends round Ayot Place and reaches a drive. Turn right and follow the drive to the large gates ahead. Go through a door to the right of the gate and then another door on your left. Walk to the lane and your way is straight on, heading north along the lane until it bends to the right. Here you take the bridleway on your left. 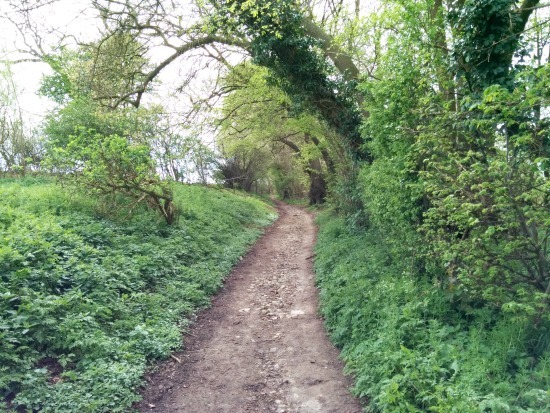 Follow this bridleway across the fields until you reach another lane. Cross this lane and continue heading north-east across the fields until you reach another lane. Turn right and follow this lane as it bends round to the left and into Ayot St Lawrence. The Brocket Arms is on your left and here you can have a pint of real ale and a snack if you arrive during opening/serving hours. After leaving The Brocket Arms, turn left and head south through the village down Bride Hall Lane. Soon after leaving the village the lane goes left and then right. At the last bend in this dogleg take the path on your left. This is a wonderful path that goes through hedgerow and woodland - past Stocking Springs - a Herts and Middlesex Wildlife Trust reserve - and eventually reaches Codicote Road (you can cut through Stocking Springs because a path through the reserve runs parallel to the one you are taking). Cross the road and continue along the path directly opposite, heading south-east along the side of Fish Wood and Warren Wood until you reach the Ayot Greenway. Turn left on Ayot Greenway and follow the path back to the car park.